Shout out to CTC Member (and Dana's husband) Scott Frost for passing this information along. Dana, good luck from your triathlon family, the Cleveland Tri Club! “My husband has a nickname for me, it’s ‘Finish Line’. He says that I live my life as if many aspects are ultimately a race to a finish line. He knows me pretty well,” says Dana Blasey 48-year old triathlete, Cleveland Triathlon Club member and Sagamore Hills resident. Dana has been participating in triathlons for nearly 11 years now. During most weeks she trains 7 days a week and calls strength training “a rest day”. Dana is tough as nails but as humble as she could be about her triathlete lifestyle. On May 4th she will be competing in a long distance aqua-bike race at the ITU Multisport World Championships in Pontevedra, Spain. The event will see duathlon, long distance triathlon, aquathon and cross triathlon championship races organized together during a week-long festival and allows for athletes to compete in various multisport races. “We are very grateful for this designation, as Pontevedra has a strong bond with our sport, which was seen in the numerous competitions held here both nationwide and internationally,” said José Hidalgo, President of the Spanish Triathlon Federation. 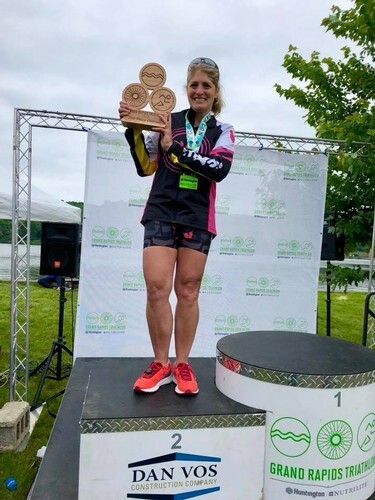 “Pontevedra is a venue that feels and breathes the values and challenges of triathlon.” During Dana’s race she will swim 1.8-miles and then bike a 23-mile mountainous course for 3 laps and a total distance of 70 miles. Dana has no interest in winning. She competes for the fun of the sport and to surround herself with many other triathlete friends to share Dana’s multisport passion and positive attitude. But don’t be fooled, Dana is very competitive with herself and failure is not an option when it comes to crossing the finish line on race day. “On September 11, 2016 I was racing in Sandusky at the Rev 3 half distance event (1.2-mile swim, 56-mile bike and 13.1-mile run). I had come out of the water behind the 2nd place female. Cycling is my favorite discipline and I just knew I could catch her on the bike course. But then I made a rookie mistake as I navigated several turns at Huron High School, my pedal touched the pavement as I leaned into a 90-degree corner. I immediately catapulted over my handle bars and onto the ground. My first concern was to avoid being an obstacle for other race participants. Then when I tried to lift myself off the ground my right shoulder had a different plan. I looked more closely and saw the bone protruding upward and stretching my skin. Then I knew my race was over that day.” Dana has had her share of injuries and accidents before and during her 11-year triathlon racing tenure. “I’m in good health and ready to race in Spain,” says Dana. “The aqua-bike race features my two favorite multisport disciplines, swimming and biking.” She was even able to get an electronic file of the cycling course for Spain and has it uploaded to a training app called Zwift. The app allows Dana to mimic the elevation and intensity of the mountainous terrain that will challenge her with on May 4th . Thus far, all of Dana’s training rides have been indoors given the winter climate of Cleveland. “I’m hoping to get a few outdoor rides in before I have to ship my bike to Spain on April 15th. This is my “A” race for 2019 and the clock is ticking.” After Dana crosses the finish line she will immediately begin training for Ironman Wisconsin on September 9th . For more information on the Cleveland Triathlon Club visit https://www.clevetriclub.com/.